As the 2015 Asia-Pacific Economic Cooperation (APEC) summit got underway at the Filipino capital of Manila on November 18, the prospects of Indian membership reverberated in appropriate circles. India’s inclusion in APEC is hoped to further integrate the Indian economy into the Asia-Pacific economic milieu as well as boost its ‘Act East Policy’. India’s accession to APEC will also be equally advantageous for the forum. The motto of APEC 2015 being ‘building inclusive economies, building a better world’, the block is attempting to reconcile the age-old differences between economic growth and development. While setting agenda during December,2014, the APEC senior officials set the priority areas as ‘enhancing regional economic integration; fostering micro, small and medium enterprise participation in regional and global markets; investing in human capital development; and building sustainable and resilient communities’. However, the gruesome terror attacks in Paris and the South China Sea developments now threaten to barge into the deliberations. Apart from facilitating greater regional economic integration, APEC promotes the development of small and medium enterprises in the member countries by ‘removing hurdles to starting a business, getting credit, dealing with permits, enforcing contracts and trading across borders;’ the avowed goal being to make it 25 per cent easier to do business in the region by the end of 2015 and to reduce the tariff on a list of 54 environmental goods to achieve these objectives. It envisages intra-APEC student exchange to further facilitate development of human capital. APEC is thus subtly morphing into a facilitator for other regional economic integration mechanisms, more so as a stepping-stone towards Trans-Pacific Partnership (TPP) which somemembers prefer over other mechanisms such as theFree Trade Agreement for the Asia Pacific (FTAAP). The Beijing APEC summit (2014) resolved to realise the full potential of FTAAP which, when fully operationalised, will be a much bigger intra-regional trade block than that of European Union(EU) or North America Free Trade Agreement (NAFTA). That rendered the Beijing Roadmap for APEC’s contribution to the realization of FTAAP the major outcome of 2014 Summit. TPP members, however, prefer TPP norms over the ASEAN-led Regional Comprehensive Economic Partnership (RCEP)insisting that FTAPP should wait until TPP is ratified and realised. A fully out blown range of regional economic arrangements with overlapping members has enmeshed the Asia-Pacific region literally in an‘alphabet soup’. Six of the 16 RCEP members — Australia, Brunei, Malaysia, New Zealand, Singapore and Vietnam — are also members of the 12-member TPP. FTAAP includes all RCEP and TPP countries except India, while both India and China are not part of the TPP. While all TPP members are also a part of APEC, not all APEC members constitute the negotiating team for RCEP e.g. the United States.Streamlining membership issues including coalescing the RCEP, TPP and FTAAP together, straightening tariff and non-tariff issues will be a huge challenge and APEC could provide a useful platform in this juggle. Obama’s efforts to reinforce TPP clash with Chinese interests, who pitch for FTAAP, thus turning APEC into another US-China battleground as Putin questions the very rationale ofTPP. 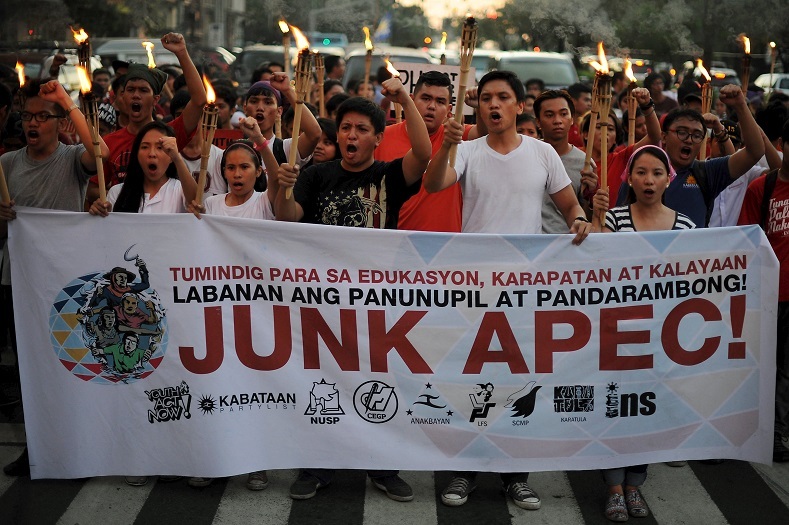 Without APEC, India is out of all groupings except RCEP. APEC entry will provide a boost to ‘Act East Policy’ and brighten India’s chances to get into TPP and FTAAP to further integrate its economy into the Asia-Pacific economic milieu since it has strong bilateral economic ties with most of the individual APEC countries. APEC membership is a ‘gentleman’s promise to ensure entry in the TPP’.Membership also provides other advantages like opportunity to socialise with the developed economies of the Asia-Pacific region, move quickly along the reforms path and work towards making the economy more competitive rather than fighting for differentiated tariff liberalisation. Accession of India- the third largest economy in GDP (PPP) terms- to APEC will be advantageous to the forum in equal measure. Despite request for membership, India is not yet a member of the forum. In 1998 India’s application was turned down in favour of Peru, Russia and Vietnam; India of 2015 under Modi is different, its APEC membership now supported by major economies like US, Japan, Russia and China. While hosting APEC summit (2011), United States had invited India as an observer. Obama also advocated for India’s membership during his visit to India in January 2015. The current Manila summit does not ensure India’s immediate membership of this economic forum of 21 Pacific Rim countries but the ‘Missing link in India’s Act East Policy’, as former foreign secretary Shyam Saran calls it, needs to be filled sooner rather than later. Invitation for APEC membership might happen in Peru (2016) or Vietnam (2017) .Wait gets longer for New Delhi, but it will be worth. Inclusion of a growing and rising economy like India will definitely inject new dynamism to the group while working as a catalyst to usher in more economic reforms in India. It will be a win-win situation for both APEC and India.